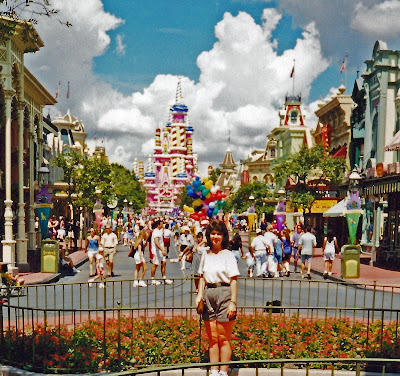 Home � Magic Kingdom � Do you remember when Cinderella's Castle Looked Like a Cake? Do you remember when Cinderella's Castle Looked Like a Cake? Do you remember when Disney World transformed Cinderella's Castle as part of it's 25th Anniversary? It's true. In October of 1996, as part of the celebration of the 25th Anniversary of the Walt Disney World Resort, they transformed Cinderella's Castle in the Magic Kingdom into a giant pink birthday cake. When combing through some old pictures I was able to locate two pictures that captured the castle in all of its pink, outlandish glory. The transformation was in place on October 1st, 1996 (the actual anniversary date) and lasted until January 31st, 1998 when they restored the castle to its former, more regal state. Although this transformation was not really thought of fondly by the Disney purists, it certainly made a memorable site to see. 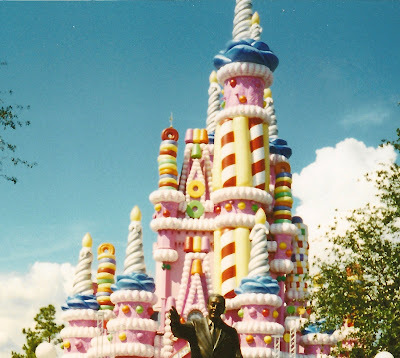 The castle did look like a giant candy laden, decorated cake. There have been other castle transformations over the years, but none as bold as this one. You can see how the Main Street view is quite different from this one taken last Fall. May Disney World continue to take risks in their attempt to entertain, enchant, and amaze us. 2 comments to "Do you remember when Cinderella's Castle Looked Like a Cake?" Cinderella's Castle was a big pink cake the first time I ever went there. I have since been back to see it in it's regular form but I must say it is pretty cool to say that I saw it as the big pink cake.